The Joint Seat Allocation Authority (JoSAA) 2017 released the list of seats vacant across all participating institutes after round six. Seat allocation is done on the basis of AIR (All India Rank) in JEE (Joint Entrance Examination) Main, and Advanced. Approximately 460 seats are vacant at the Indian Institutes of Technology (IITs), and 5,400 seats at the Indian Institutes of Information Technology (IIITs), National Institutes of Technology (NITs) and Government Funded Technical Institutes (GFTIs). JoSAA is set-up by the Ministry of Human Resource Development (MHRD) to manage and regulate joint seat allocation for admissions to various IITs, IIITs, NITs, and GFTIs. Today, July 22, 2017, is the last day for seat acceptance through JoSAA. Authorities will get the final figure on the number of vacant seats after today. Students allocated a seat in round seven must report to any of the given reporting centres by today. 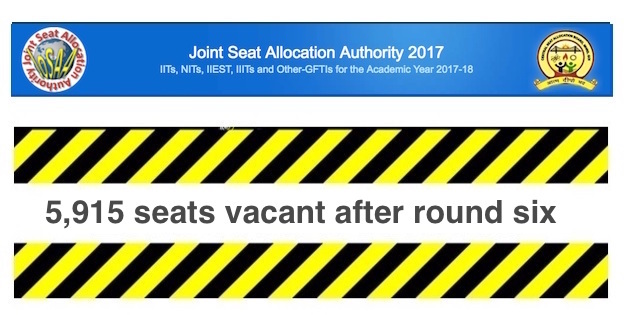 If they fail to do so, they will not secure admission, as today is the last day of seat allocation for the 2017-18 academic year at IITs, IIITs, NITs, and GFTIs. Iam planing to go for CEED exam ie., M.Des exam for next year.Please can you give me any information about CEED exam material.